The elegantly decorated rooms, marbled corridors and imperial gardens at Hotel Rambagh Palace echo its glorious history. Every nook and corner of the hotel has a story to tell. The Rambagh Palace was built in the year 1835. 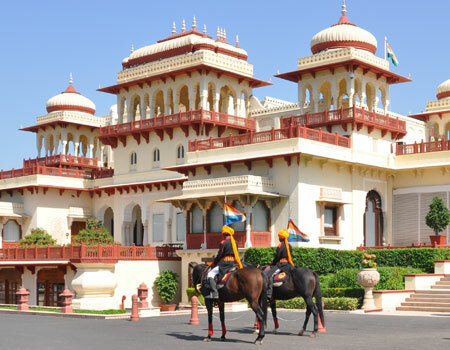 Fondly known as the 'Jewel of Jaipur', the palace functioned as a home to the royal family of Jaipur till 1957. It was later transformed into a heritage hotel and now belongs to the Taj group of hotels. Staying at the Rambagh Palace seems like reliving the Rajput era. The finely furnished rooms offer an experience of living like a king to its guests. The hotel has 85 rooms including the suites. These suites were once the home to the Maharajas and depict their style of living even now. Rich fabrics and silk drapes in the rooms beautify their interiors. Experience a distinctive dining experience at Hotel Rambagh Palace. The guests dining here can enjoy the best cuisines from India and abroad. The grand dining hall, Suvarna Mahal serves an array of delectable dishes. The melody of classical music that accompanies makes the evening a perfect one for fine dining. The Rajput Room is the informal dining place which is best suited for breakfast and other light meals of the day. The refreshing beverages served here are a gourmet's delight. The interiors of the well stocked Polo Bar at Rambagh Palace covers even the smallest details of the royal sport Polo. Tastefully designed in a theme to suit its name, the Polo bar serves refreshing and signature cocktails. In the finest custom of Rajput hospitality, the Rambagh Palace offers a true taste of luxurious living to its guest - a privilege that was earlier reserved solely for the kings.